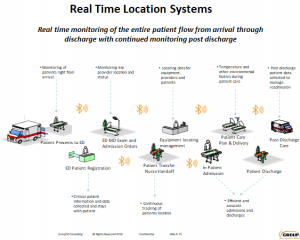 Home > Healthcare > Healthcare – Are you Getting What You Expected from Your Real Time Location System – RTLS ? So, I couldn’t help but wonder “if it is so great why aren’t more healthcare organizations running to implement RTLS?” It’s been around for years and only a small fraction of hospitals and other healthcare facilities have bought in. I reached out to healthcare executive leaders with the belief they would be all over RTLS and the incredible improvement opportunities successful implementations have realized. The reality is that most healthcare leaders don’t know about the latest application of open source technology that makes RTLS cost pennies on the dollar when compared to older proprietary systems. And while I would not call this a definitive or conclusive study, what I learned was very interesting. I learned there is a wide gap between early versions of RTLS in healthcare and today’s systems. Older versions were very expensive to buy and implement and even after the installation was complete the system often had limitations and issues. Because the Total Cost of Ownership created a poor ROI, it was difficult for executives to make a good business case for the acquisition of a RTLS system. For example, older systems required hard wiring, created significant disruption during install and had blind spots. Even though it provided real time asset data and information it was not integrated with the hospital’s other IT systems, and at the end of the day, it became more work for everyone. Today’s RTLS is a system that can provide real-time tracking and management of medical equipment, staff and patients and be installed within existing wireless infrastructures in a matter of days without disruption. And today’s RTLS does more than locating assets, providers and patients. It provides data and is integrated with other IT systems and helps improve workflow, reduce costs, improve asset utilization and increase clinical quality. Imagine being able to find any piece of equipment or a patient with a smart phone. 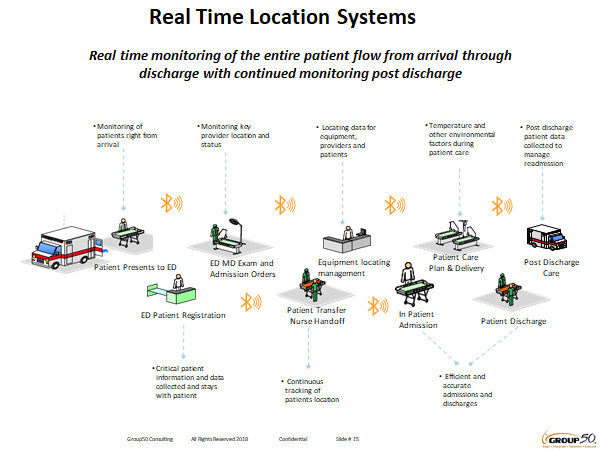 Today’s systems can provide fall detection and monitor 20+ vital signs for patients no matter whether they are in the hospital or at home – post discharge! In contrast to older versions of RTLS, today’s buy-in is a fraction of the cost (pennies on the dollar) and the technology is far more robust and reliable because it uses low energy blue tooth technology – not RFID, Infrared or other hard-wired technologies. The better news is that the flexibility of these new technologies doesn’t require you to scrap previous investments. Okay, so earlier versions were expensive, disruptive and not as effective as they needed to be. But today’s version is much more cost effective, not disruptive, more robust and able to integrate with other systems. So, why aren’t healthcare organizations flocking to the new RTLS? And what about all those healthcare organizations that already have older versions of RTLS? What was the common factor in both the older version of RTLS and today’s newer, cheaper, and better version? The answer is knowing about it and RTLS is operationalized. Hospital staffs have to juggle a demanding workload. What is the amount of effort doctors, nurses, equipment technicians, administrative personnel, or IT staff required to learn, support or maintain the RTLS components? Hospitals are information-intensive organizations. By increasing the amount of data captured and improving communication, RTLS can help improve the overall quality of care while simultaneously decreasing costs. But operationally how does all that take place. Workflows need to be redesigned, developed and documented into work instructions and then the staff has to buy in and use the data to make it a value-added process. Analytics that are currently available are underutilized because care givers have other work flow priorities. Analytics must be easily understood and actionable and there must be supporting change management that will fix the problems and give caregivers more time to provide care and execute clinical protocols. Data must be integrated into their existing tasks and not added to their work load. Implementing RTLS needs to have an operational game plan. It certainly will include the selection, installation and implementation of RTLS hardware and software, but maybe more importantly, the needed steps to integrate and operationalize RTLS system capabilities into the daily work flows and activities of the people currently doing the work. Without the game plan organizations run the risk of having another data providing system that no one will use. During an interview with a large system hospital COO and he “admitted that they had great hopes for the technology but have not been able to get much from it”. He blames it in part on the hospital infrastructure (e.g., dead zones), a major short coming of the old technology. But he also was clear that “to me, it seems like another case where technology was expected to accomplish something in the absence of basic operational management”. The bottom line is that few healthcare leaders are aware of the new low cost RTLS capabilities and the power of the combination of blue tooth based RTLS through THINaër, patient monitoring wearables from Sensogram and Group50’s capability to integrate it into the twelve critical workflows. Group50 offers a RTLS assessment that provides Healthcare leaders with insight on the opportunity to upgrade to the newer technologies or implement them now that they are very cost effective. Call a Group50 RTLS expert today at 909-949-9083, drop us a line at info@group50.com or request more information here.